The internal Microsoft team, which works on frequent experimental projects within the company, is called Garage. And it has designed and launched a new application for iOS and Android. It allows to transfer photographs instantly through a wireless network. Something similar to AirDrop in Apple systems. The new Photos Companion application is available for both the iOS and Android platforms. 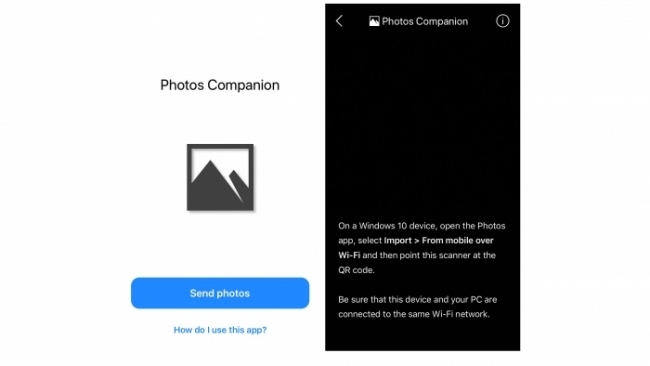 Microsoft describes it as an “experimental” application that works together with the Microsoft Photos application on a Windows 10 computer or laptop. This application that works in the Windows operating system, can attract large numbers of people. Since many people own Windows 10 computers. In turn, we will have to use the native Windows 10 Photos application . How can I transfer photos and videos to Microsoft Windows 10? The use of the application is quite simple. Once installed, the user must give permission to access the photos and videos on the installed Android or iOS device. 2. We will select the photographs and videos that we want to transfer. Once the user is satisfied with what they have chosen, the photographs are transmitted without problems to the PC and saved in the Photos application along with any other media that is already there. 1. If Import does not appear, we must click on the three points. 2. We will click on Settings . 3. We will go down to Visualization and a section of Help to Microsoft will appear to import content via WiFi . 4. We will close the application and reopen and go to Step 1 above. In terms of the user interface, the Photos Companion application is scarce. It can be said that it is part of an experimental version. Since it does not seem to be ready for production from an aesthetic point of view. That said, in terms of functionality, it works extremely well and does exactly what Microsoft points out. That is all that really matters when you download an application for a specific functionality.